Often referred to as a color which denotes regality, purple effectively combines two of the most powerful colors in the decorative palette – blue and red – boldly underscoring the depth and subtlety of each while confidently standing on its own in terms of design aesthetics. While underutilized in many modern homes and offices, the color is widely found in many antique Persian and Oriental rugs, particularly those which were handwoven for royal blood lines or as gifts to visiting dignitaries. 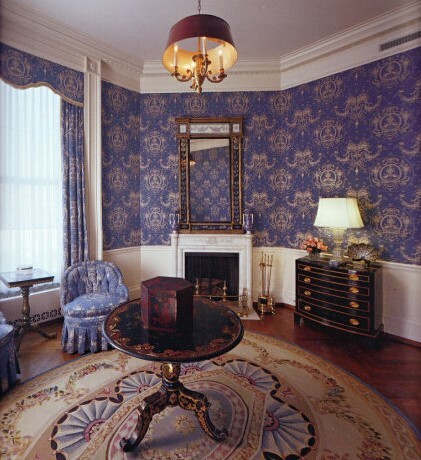 Today, one of the premier examples of purple décor can be seen in the Queens’ Sitting Room at the White House, where the hue is impeccably joined with complementary colors such as white and black, as well as bold variations of the yellow spectrum ranging from pallid tans to luxurious gold treatments. Below you will discover three enchanting ways purple may transform the way you view the color, and potentially inspire you to employ its use in your next decorating project. The shadier end of the purple scale reveals rich plums and violets, which are perfectly suited (and often accompanied with) lighter shades that bring out the fullness of their mysterious and magical elements. When decorating, the best way to utilize these darker colors is to creatively build around the lighter tones in your carpet with the more agile-colored accoutrements that contain minor smatterings of these grandly complected shades. Though less associated with royalty than deeper purples, Oriental and Persian rugs which employ the lighter side of purple allow both artists and decorators a greater degree of flexibility with supplementary color schemes. Essentially, an air of wealth and ambition is replaced with dignity, devotion and peace to create a more feminine aesthetic on one hand, or work in combination with other colors to explore the splendor of nature and imagination on the other. If you need a room that explores both intellectual intimacy and speculative leisure, you will certainly enjoy this treatment in your home or office. Far more illuminating than either end of the spectrum, gently rendered lavenders and intoxicating mauves are typically used to create a presence that both captivates and endears. A bold choice for any room, even the most seasoned decorator may find it difficult to identify accompanying furnishings for the shades; yet, once an overall scheme has been established, there are few if any colors that will compare to this room’s elegance and radiance when bathed in the regalia of these centrally positioned hues. Whether you are redecorating or searching for the right Oriental rug for your home or office, be sure to visit our showroom, or browse our inventory, for a large selection of antique and modern carpets certain to redefine your living or work space. However, if you already own a rug which has seen better days, allow us to revive your treasured piece through our cleaning services or by having one of our Oriental rug specialists make any necessary repairs. Happy decorating!